Construction of the villa began around 1735 under the Fattori family, on the same wing as an existing 16th-century wine cellar and on the original site of an ancient arusnate settlement which later became a settlement from the Roman period. It was then sold, unfinished, to Mosconi in 1769, who completed the estate by adding a beautiful eight hectare English-style Romantic garden. He also expanded the wine business, making it one of the largest wine cellars of its day in Northern Italy. During the Mosconi period, the villa became an important intellectual and literary salon, frequented by cultural figures of the time, including the poet and man of letters, Ippolito Pindemonte. By the first half of the 20th century, the villa had suffered years of neglect and vandalism. Parts of the garden and some of its rooms fell into complete disrepair. In 1957, it was bought and restored by the Bertani family to house the headquarters of their eponymous wine cellar. 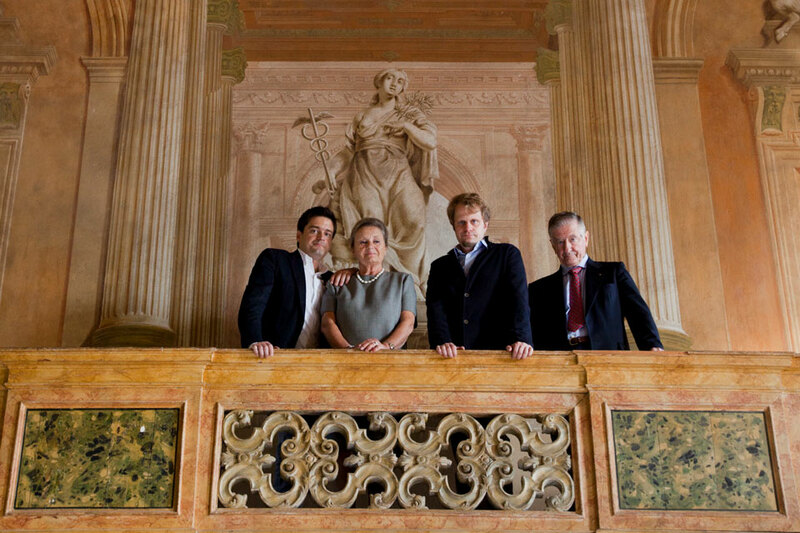 Gaetano Bertani and his family purchased the winery in 2012, continuing the family tradition of wine making. The complex consists of a main building with two lower advancing wings, ending in two symmetrical facades. The bell tower of the chapel —dedicated to St. Gaetano— is built on the east wing. Gates on both wings grant access to the laborors’ housing and the cellars. 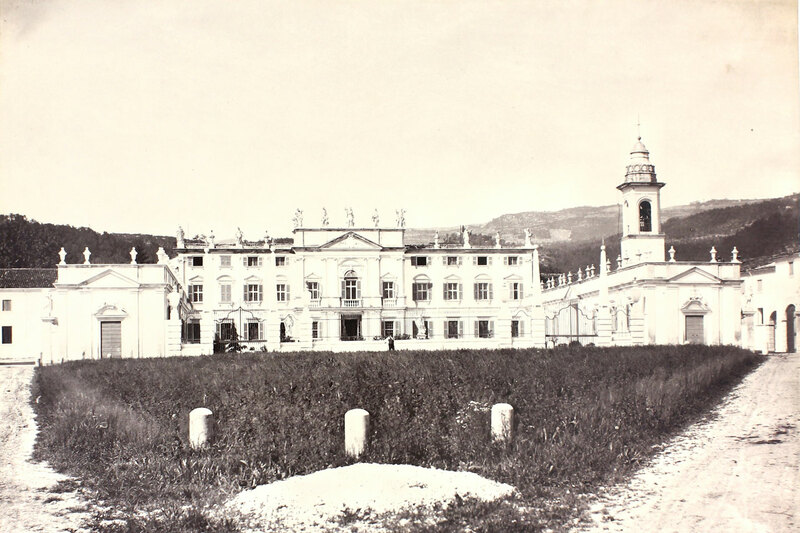 Commissioned by the first owner of the estate Giacomo Fattori, the construction of the entire complex —consisting of the central structure of the villa, the chapel and cellars— was originally designed by the architect Lodovico Perini and later completed in the first half of the 18th century by the Veronese Adriano Cristofali. Fattori ordered the construction to replace an existing 16th-century residence. The improvements made by the Fattori family were designed to give the home an aristocratic air, and had a clear self-congratulatory purpose, since Fattori had recently been awarded the title of count. Cristofali skillfully succeeded in working out the central structure, clearly classicist in style, and the re-envisioning of the two perpendicular wings. With this layout, he created a front garden area and cleverly concealed the view of the workers’ quarters —hardly aristocratic— as well as separated the areas dedicated to leisure and folly from those strictly for agricultural use. The main building is three stories consisting of a central pavilion marked by a double row of columns, Tuscan Order on the ground floor and Ionic on the upper level, a pediment containing the coat of arms (later added by Trezza), and topped with five statues of mythical greek gods. The statues in the garden are attributed to the sculptor Lorenzo Muttoni. The top band contains fantastic architectural trompe l’oeil, which give a perspective to the whole connotation. The lateral monochrome paintings are of statues representing Abundance and Justice. The satyrs above the doors evoke the four seasons. 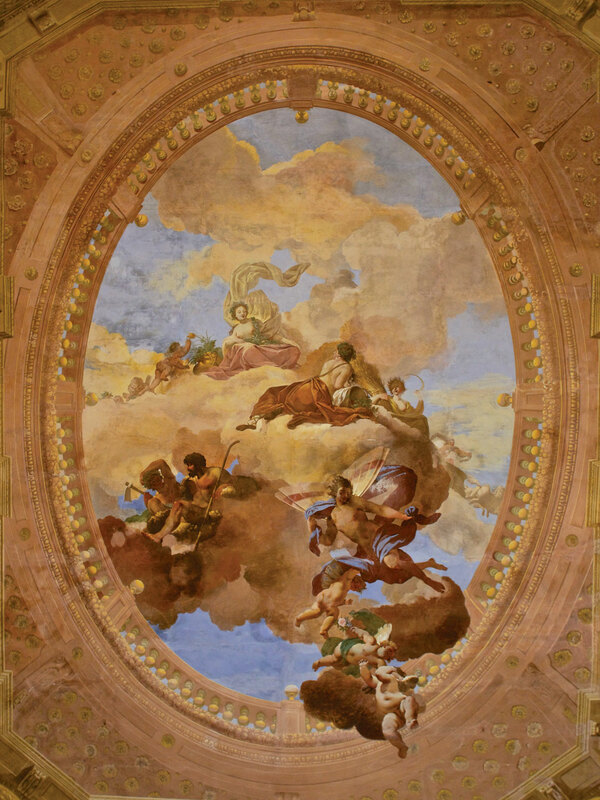 The four seasons and the passage of time —a clear reference to the agricultural setting and purpose of the estate— are the main themes of the ceiling fresco. In the center, sitting amongst colorful flowers, the goddess Flora. To her bottom left perches Aestas, or Summer, painted in warm, bright colors. On the opposite side, in clear contrast, in dark storm clouds, are Fall and Winter. Hovering over all in the foreground is Favonius, god of the favorable west wind, accompanied by playful angels, and in the background, one can just discern Apollo in his chariot. The frescoes were painted by Emilian artists, active in Verona. In particular, the decorative cycle of the two horizontal bands is attributed to trompe l’oeil painter Prospero Pesce, from the school of Filippo Maccari. The central ceiling fresco is attributed to Giuseppe Valliani, known as ‘The Pistoian’. By the end of the 18th century, Romanticism, the fashion of the time, had spread to Verona. English-style gardens started appearing —rolling landscapes, exotic plants, meandering paths, hidden corners with faux archaeological ruins— instead of the Italian style, which was predominantly green and ordered. Following this trend, the brothers Giacomo and Guglielmo Mosconi reshaped the land behind the house, adding two prominent features, a garden and a small wooded area. They installed a pond, fed by springs located on the property with an island in the center and accessible by a wooden bridge. The island was planted with tall, standing Taxodium, conifers in the cypress family. The brothers also constructed a Northern European-style Kaffeehaus on the edge of the pond, facing the island. Ippolito Pindemonte himself had a hand in the final design of the romantic gardens, and it is partly to him we owe the predominence of the English style. Apart from the non-indiginous plants the island and some Lebanese cedars, the trees are more consistent with local vegetation. In 1820, the Persian described a “garden with a variety of exotic plants” which inspired the Veronese painter Angelo Dall’Oca Bianca. On the far side of the pond stands the Kaffeehaus, built at the suggestion of the poet Ippolito Pindemonte, who had been impressed by springs and fields he had seen while vacationing in France with close friend and host Jean-Jacques Rousseau. In the afternoon it served as a reading area, perhaps for visitors returning from a walk. In the evening, it lent itself to parlor games such as chess, the air filled with the lilting strains of a harp, played by the daughters of the Countess. The villa’s icehouse, also located in the garden, was built in the late 18th century and used until the first half of the last century. The original statues, chairs and a small bubbling fountain still stand within the garden. The ample walled space, located directly behind the villa, encloses the grounds as well as an extensive vineyard, giving the entire landscape the feel of a country garden. On the front side of the elegant villa, a gate marked by boss pillars with gables and decorative vases encloses the courtyard and an anterior garden. Its symmetrical shape is centered on a large, circular basin and flowerbed, used for ornamental purposes, but also to indicate the correct direction for incoming and outgoing carriages to the villa. The presence of grape cultivation was first documented in 1028, though oral traditions hold that vines were grown on the grounds of Novare long before. 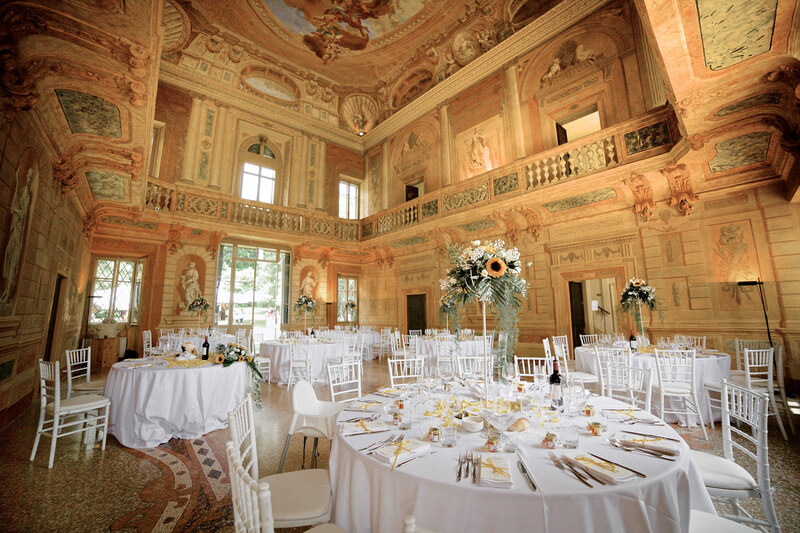 The first significant production of wine at the villa is credited to Fattori, owner of the estate from 1679 to 1769. For instituting a substantial change in cultivation practices and for the expansion and refinement of enological technique, however, credit is due to Luigi and Cesare Trezza who significantly altered the estate between the years of 1868 and 1931. In those days, wine produced at Novare was already well-known but when, in 1820, Trezza acquired the 230 hectare estate, only 30 were being used for the cultivation of grapes. In eight years, the cultivated area was increased to 85 hectares and eventually to 110. 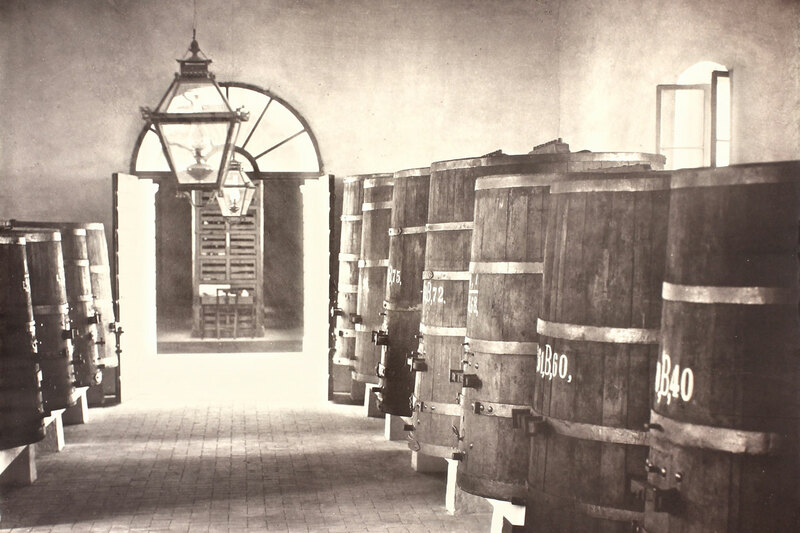 At the end of 1883, the cellars of Novare held about 3,000 hectolitres of vintage wine plus some hundreds of hectolitres more to be aged for a minimum of three years in oak barrels and then bottled. The classic Valpolicella Amarone, dating from 1936, was invented at the Villa Mosconi Bertani thanks to the mistake of a cellerman who had left a Recioto to ferment longer than prescribed. In 1957, the estate was purchased and renovated by the Bertani family to establish the headquarters of the eponymous winery. Since 2012 the villa has been the property of Gaetano Bertani who, from this historic seat, continues in the family tradition of superior wine-making.